A view of the winter night sky showing where the constellation Orion will be visible. If you look about due south around 9 p.m. your local time this week, you may see a familiar sight dominating our winter skies: the Great Hunter or Celestial Warrior, Orion, the most brilliant of the constellations and visible from every inhabited part of the Earth. 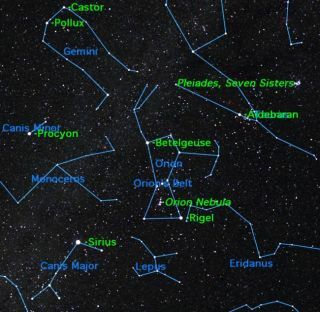 This Orion constellation sky map shows what the famed star pattern will look like in the winter skies of the Northern Hemisphere, weather permitting. As is also the case with the mighty Hercules, the figure of Orion has been associated in virtually all ancient cultures with great national heroes, warriors or demigods. Yet, in contrast to Hercules, who was credited with a detailed series of exploits, Orion seems to us a vague and shadowy figure. The ancient mythological stories of Orion are so many and so confused that it is almost impossible to choose among them. Probably the best known is the one where he got into trouble for bragging that no game could ever escape him. This annoyed the goddess Hera, who sent a poisonous scorpion (Scorpius) to sting his heel, and Orion subsequently died. Orion, however, was brought back to life by the great physician, Aesculapius who got his medical secrets from the snakes. But the god Hades, King of the Dead, heard about this miraculous deed and became concerned about the future of his kingdom. So he asked Zeus to intervene, and Zeus threw thunderbolts and liquidated both Orion and Aesculapius. As a precaution, Orion and the Scorpion were placed in opposite parts of the night sky so they could never get into further trouble. Even the origin of the name Orion is obscure, though some scholars have suggested a connection with the Greek "Arion," meaning simply warrior. All, however, agree that Orion was the mightiest hunter in the world at his time and he is always pictured in the stars with his club upraised in his right hand. Hanging from his upraised left hand is the skin of a great lion he has killed and which he is brandishing in the face of Taurus, the Bull, who is charging down upon him. Shining down upon us through the frosty air all winter long are three bright stars in line in the middle of a bright rectangle decorating Orion's belt, which points northward to the clusters of the Hyades and Pleiades of Taurus, and southward to the Dog Star Sirius. Within Orion we find two immense stars, Rigel and Betelgeuse, apparently at two entirely different periods in a star's existence. In Rigel (the "Left Leg of the Giant"), we find a star apparently reaching the prime of its life. It's a true supergiant: a blazing bluish-white hot star of intense brilliance and dazzling beauty that is one of the rarest stellar breeds in our galaxy. Located 800 light-years away, Rigel's computed luminosity is about 36,000 times the brightness of our sun. Betelgeuse ("The Armpit of the Giant"), in contrast, shines with a cool, dull ruddy hue and is 520 light-years away. It is an irregular pulsating supergiant star, nearing the end of its life and as such it expands and contracts spasmodically. Incredibly, Betelgeuse's diameter can vary between 550 to 920 times the diameter of our sun. It's truly a gigantic, bloated globe of cooler gas. If such a star were to replace the sun in our solar system, it would easily extend beyond Mars' orbit. Stars produce their energy by fusing hydrogen into helium deep within their cores. When a star accumulates sufficient helium in its core, its energy output increases significantly, and it swells into a red giant or supergiant, like Betelgeuse. This is what Rigel will become in a few million years. In such stars, the core produces successively heavier elements to balance the incessant crush of gravity. But once the core begins creating iron, a star's days are numbered; the formation of elements heavier than iron consumes rather than produces energy. Eventually, since the core can no longer support the star's vast weight, it collapses, triggering a cataclysmic supernova explosion. Betelgeuse is in its final stage and could explode in only a few million years. We finish our tour of the Orion constellation with undoubtedly one of the most wonderfully beautiful objects in the sky: the Great Orion Nebula. It appears to surround the middle star of the three in line that marks the hunter's sword. It's invisible to the unaided eye, though the star itself appears a bit fuzzy. It is resolved in good binoculars and small telescopes as a bright gray-green mist enveloping the star. In larger telescopes it appears as a great, glowing irregular cloud. A sort of auroral glow is induced in this nebula by fluorescence from the strong ultraviolet radiation of four hot stars entangled within it. Edward Emerson Barnard (1857-1923), for many years an astronomer at Yerkes Observatory, once remarked that it reminded him of a great ghostly bat and that he always experienced a feeling of surprise when he saw it. My good friend Sam Storch once hunted down the Great Nebula with binoculars. Not unusual, except that Sam did it during the total phase of a solar eclipse in Mexico in July 1991! The Great Orion Nebula is a vast cloud of extremely tenuous glowing gas and dust, approximately 1,600 light-years away and about 30 light-years across (or more than 20,000 times the diameter of the entire solar system). Astrophysicists now believe that this nebulous stuff is a stellar incubator; the primeval chaos from which star formation is under way.